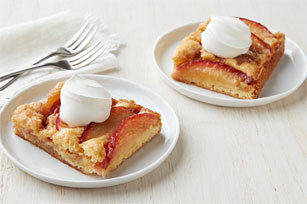 Enjoy plums in our easy-to-make cake recipe. Add vanilla instant pudding to the cake and finish with fresh plums and a streusel topping. Our Plum Crumble Cake recipe is sure to become a family favourite. Combine flour, dry pudding mix and baking powder. Beat 1/4 cup butter and granulated sugar in large bowl with mixer until blended. Add eggs; mix well. Add flour mixture alternately with milk, mixing well after each addition. Spread onto bottom of 13x9-inch pan sprayed with cooking spray; top with rows of plum slices. Mix remaining butter, brown sugar and nutmeg until blended; crumble over plums. Substitute sliced peeled fresh peaches or nectarines for the plums.